Crewel embroidery is a style of free embroidery that uses a variety of different stitches and techniques. Crewel embroidery stitches follow an outline of the embroidery design applied to the foundation fabric. We have three new Crewel Embroidery Kits from Dimensions to share with you today. These creative needlecraft kits make it easy to create beautiful hand embroidered needleart for your home. You'll find them in the Embroidery Kits section of the store! 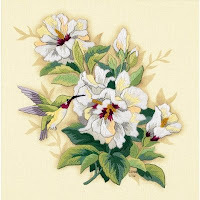 The Hibiscus Flower - Crewel Embroidery Kit is an elegant crewel embroidery design. The kit includes wool & acrylic yarns, cotton thread, printed ivory homespun, needle, and easy instructions. The finished design size is 12" x 12". The outline of the design is pre-printed on the fabric, eliminating the added steps of having to transfer the embroidery pattern before you can get started. This traditional needleart design uses soft neutral tones, perfect for a formal living area or master bedroom suite. 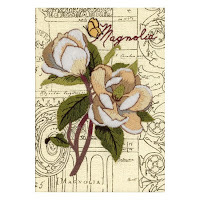 The White Magnolias - Mini Crewel Embroidery Kit is a new crewel embroidery design from Dimensions with a finished size of 5" x 7". The smaller size makes this an easy hand embroidery kit to finish! The thicker yarns used in crewelwork create a textured, dimensional effect. Crewel embroidery uses an interesting variety of stitches for outlining and filling in the design. Common stitches include satin, stem, and couching. French knots are also used for added texture. Kits include detailed instructions and diagrams showing how to complete the embroidery stitches used in the design. The contemporary appeal of this design will add a touch of casual elegance to your home decor. 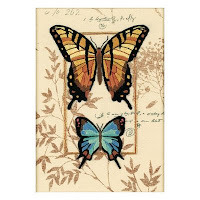 The Butterfly Duo is a mini embroidery design that uses cotton and metallic threads. The embroidery pattern and the decorative background design are preprinted on ivory sailcloth. This colorful and artistic needleart design will add warmth to any room in your home. These mini stitch kits are also perfect for giving as a thoughtful house warming gift. You'll need some basic embroidery supplies to get started, including an embroidery hoop, to hold the fabric securely while stitching, and embroidery scissors for snipping threads. Visit the Embroidery Kits section to see our complete selection of crewel embroidery kits, stamped cross stitch kits, counted cross stitch kits, and more! Explore a wide range of needlecraft kits at Weekend Kits and be ready to create hand embroidered needleart on your next Weekend at Home.